The Two Red Roses Foundation of Tarpon Springs, Florida, has recently acquired two masterworks from the Byrdcliffe Arts & Crafts Colony, expanding an already outstanding collection of furniture made by this utopian community. Byrdcliffe was established in 1903 in Woodstock, New York, by Ralph Radcliffe Whitehead, a British émigré, and his American wife Jane Byrd McCall, as a rural retreat for artists to work and teach. 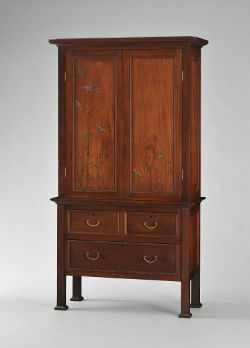 A unique mahogany cabinet with wild carrots painted by Zulma Steele (1881-1979) was purchased earlier this year from a private collector (figure 1). The fine dovetail drawer construction and traditional varnish finish of this chest are unusual for Byrdcliffe and confirm the hand of a skillful, experienced cabinetmaker. 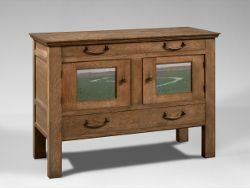 In its overall stance and proportions, the six-foot cabinet with drawers has strong British roots. Its prominent straight leg with block foot combination is often associated with Scottish Arts & Crafts designer Arthur Heygate Mackmurdo. It also relates to the eighteenth-century English "Marlborough" leg, a detail that may have been familiar to Whitehead who was raised in a wealthy Yorkshire family. In fact, the renowned American furniture historian John T. Kirk discovered a strikingly similar mahogany chest with Marlborough legs at Southwell Cathedral in Nottinghamshire, only fifty miles from the Whitehead estate. It is the hand-painted wild carrots or Queen Anne's lace, however, that give this chest its undeniable charm. Byrdcliffe artist/designer Zulma Steele embellished the door panels with delicate stems and blossoms, essentially flower studies painted directly on the varnished mahogany ground, like watercolors on paper (figure 2). As part of the documentation acquired with the cabinet , the Foundation was able to obtain the original stencils utilized for the door decorations as well as an original watercolor study signed by Zulma Steele of wild carrots (Figure 3). A more typical Byrdcliffe form is the "chiffonier", a low, broad chest with a combination of drawers and cupboards. The Two Red Roses Foundation already owned two chiffoniers, one with a carved relief designed by Steele (figure 4) and another with a painted landscape on its door panels (figure 5), both of which were included in The American Arts & Crafts Home, 1900-1915: Selections from the Two Red Roses Foundation Collection at the Leepa-Rattner Museum of Art in Tarpon Springs, Florida last spring. The recently acquired third example, purchased at auction in 2005, is the masterpiece of the chiffonier form. Widely exhibited and published, it is arguable the best-known piece of Byrdcliffe furniture (figure 6). The substantial oak chest is composed of simple horizontal and vertical elements, reminiscent of seventeenth-century English and American prototypes as reinterpreted by the English Arts & Crafts designer, Baillie Scott. 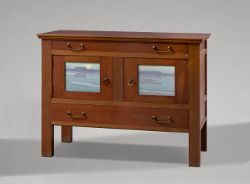 It rises on tall square legs that extend to the top, framing a deep lower drawer, a shallower upper drawer, and between them, a two-door cupboard with painted panels signed by Boston artist Hermann Dudley Murphy (1867-1945). Murphy's tranquil landscape of a river winding across a flat meadow toward distant hills is delicate and pensive. The shimmering reflected light of an imminent sunset, just before the sky changes to more dramatic reds and purples, defines the water and throws small trees and shrubbery into shadow. A transparent green stain on the oak surround originally tempered the color shift to the painted surface, but has disappeared over time. The illusion that Murphy's landscape lies somehow, magically, behind the doors of this chiffonier is in sharp contrast to the effect that Steele's carved decoration has on a similar form. The central cupboard on Steele's chiffonier has a drop-front rather than two doors, providing a single, full-width surface to decorate. She has lifted horse chestnut leaves and burrs out of their natural context and flattened the parts, a design technique known at the time as conventionalization. The resulting pattern was then carved in flat relief. Consequently, Steele's decoration remains firmly on the surface of the chest with no sense of three-dimensional space. Landscapes, on the other hand, are inherently illusion. Perhaps if Murphy had painted a different view on each panel this natural tendency would be somewhat neutralized. But he conceived a single, continuous landscape that is convincingly interrupted by the vertical stiles of doors. So the painting's internal perspective is reinforced just as it would be by a picture frame that isolates it from its surroundings. 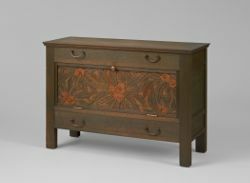 This same illusion is maintained on two other Byrdcliffe chests with painted landscapes in the Two Red Roses Collection. The unsigned painted panels on the cherry chiffonier in figure 4 and those on a taller fumed oak linen press (figure 7) seem related, as if two different artists were depicting the same landscape - a wide river valley with a distinctive flat-topped mountain in the distance and a solitary sailboat, lit by a full moon that is reflected in the water. In both cases, the composition is established in loose horizontal bands that draw the eye across the space. Like Murphy's panels, these dreamy paintings lie beyond the surface of the cabinet. Byrdcliffe was a rural oasis for artists and students, not a production shop. (The colony operated a small furniture workshop from the fall of 1903 to summer of 1905, apparently producing fewer than fifty pieces in all.) The artists, designers, and perhaps students who attended each summer session applied their individual decorating talents to forms reportedly designed by founder Ralph Whitehead and built by skilled cabinetmakers and woodcarvers. Hermann Dudley Murphy and other painters contributed painted panels for a handful of pieces. Several of these artists, including Murphy, were considered Tonalists. Inspired by James Abbott MacNeill Whistler's Nocturnes, the Tonalists tried to capture the poetic nature of the landscape, mood and nuance rather than the unblinking accuracy of realism or the crystallized light of impressionism. Marginal times of day, pre-dawn, twilight and moonlight, when color distinctions fade, allowed them to pursue monochromatic blue, green, and gray palettes. Starry nights and silent meadows were favorite subjects. Birge Harrison (1854-1929), recognized as one of the preeminent Tonalist painters, was a personal friend of the Whiteheads and taught painting at Byrdcliffe for two years. English-born Dawson Dawson-Watson (1864-1939) taught decorative design at Byrdcliffe when Hermann Dudley Murphy was there, and went on to have a successful career as an illustrator, artist, woodcarver and teacher. Victor Coleman Anderson (1882-1937) studied with Birge Harrison. 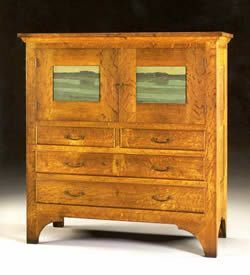 Either Anderson or Dawson-Watson may have painted the delicate blue moonlit landscapes for the cherry chiffonier or the oak linen press. The brushstrokes are smoother and the composition more abstracted that on Murphy's panels. The linen press panels are painted in a gray-green palette, while the bluer landscape on the chiffonier is detailed with a delicate outline. But the muted color scheme, dreamy poetic landscape, and quiet atmosphere of the Tonalists are all here. One can easily imagine two talented Byrdcliffe painters - teachers or students - working side by side to interpret a local view. The Two Red Roses Foundation now owns one of the largest private collections of Byrdcliffe furniture in America. Other examples can also be seen in many fine public collections, including the Museum of Fine Arts, Boston, the Metropolitan Museum of Art, the Milwaukee Art Museum, the Detroit Institute of Art, the Henry Francis DuPont Winterthur Museum, the Nelson-Atkins Museum of Art, and the Byrdcliffe Art Colony of the Woodstock Guild. The Two Red Roses Foundation is a private, non-profit educational institution dedicated to promoting an understanding of the American Arts & Crafts movement through the collection, conservation, exhibition, and interpretation of the decorative and fine arts.